This Carte de Visite by C A Duval and Co should, with any luck, help somebody with their family history. “Charles Granville Whitelocke, Lt RN, only son of Frank Whitelocke and Mary Anne W (nee Campbell)”. 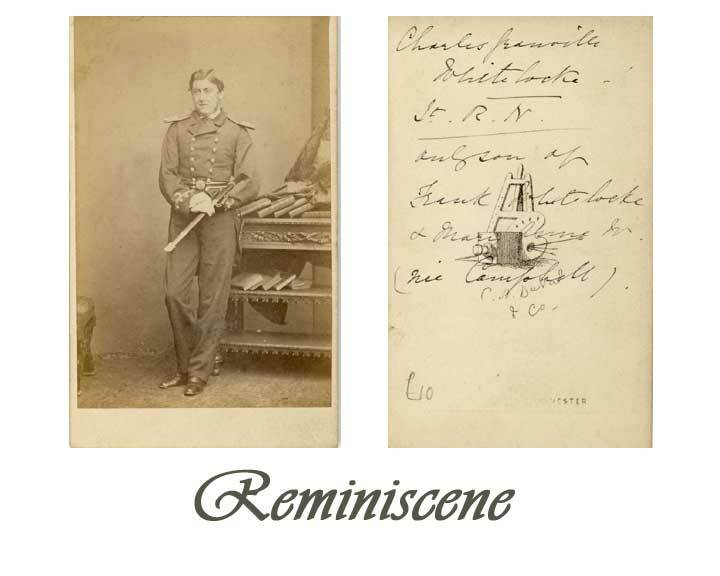 If anybody can prove their descent from Lt Whitelocke, please contact me at reminiscene.postcards@virgin.net. This entry was posted in Carte de Visite, Portrait and tagged Campbell, Lieutenant, Royal Navy, Whitelocke. Bookmark the permalink. According to Ancestry.co.uk he was baptised at St Mary’s Paddington Green on Jun 11 1842. He was born on April 9th 1842. Parents Francis and Marianne Whitelock. Address given at time of baptism was 5 Upper Hyde Park Street. Father’s occupation – gentleman. By 1881 he was lodging at 1 Calthorpe Street St Pancras. Occupation Sub Lieutenant RN (retired list). Still classed as unmarried. His naval records can be downloaded from the National Archives website. He died in Feb 1906, address 35 Colebrook Row Islington. Probate to Margaret Mannerings, widow. Note that in 1901 he was boarding at that address and was single. Francis and Marianne married in 1839 at St Mary, Bryanston Square, Westminster. At the time of the 1841 census, Francis and Marianne were living at Rosebank Cottage, Upton, Cheshire with a 10 month old Anna Whitelock. Francis was 28 years, Marianne 25 years. Both born in county, as was Anna. By 1851 Marianne appears to have died. Francis Whitelock and wife Jane, both age 38 years, were living in Tredarwan (? )Cottage, Trederwen, Montgomeryshire. His occupation – Lieut. H.E.J.C.S. Indian Navy Retired ???????? Soooo if Charles didn’t marry and have children there may be descendants of these children who can claim him. Will check to see if any more by 1861. By 1871 Jane was a widow, living in Bridlington, Yorks living off dividends and pension, with daughters Charlotte Perby Whitelock, 19 and Jane Augusta Whitelock, 17. In 1881 living with the same daughters but by now in East Barnet, Herts. Thank you very much for this useful information, Sarah. Let’s hope there is enough there for somebody to be able to prove their descent from Charles Whitelocke. The information you have given about Charles’s naval career would certainly fit with the photograph which, I think, would have been taken in the early 1870s. Interestingly, the inscription on the reverse of the photograph makes reference to “Lieutenant” rather than “Sub-Lieutenant”. I certainly would not set too much store by this difference as the scribe may well have thought that “Lieutenant” sounded a bit more important. That’s just my theory, though.